The unsung heroes of art are its facilitators – those founders, engineers, printers and the like without whose technical prowess and ingenuity the works of others could not be realised, or at least, not with such bravura. On 18 April, Phillips New York turns the spotlight on a remarkable family of master printers: the brothers Milan, Aldo and Piero Crommelynck. They had been sent to Paris to learn intaglio printing by their Belgian playwright father who had always regretted never being good with his hands. Fernand Crommelynck had intended his sons to become artists; instead they chose to bring to fruition the printed oeuvres of the giants of 20th-century art. The 100 or so prints on offer here were part of the cache of material left by Piero Crommelynck, who died in 2001. It is in one sense a motley assortment – there is everything from preparatory drawings to annotated and progressive state working proofs, not necessarily complete – but it offers a fascinating glimpse into the often surprisingly complex processes of printmaking. 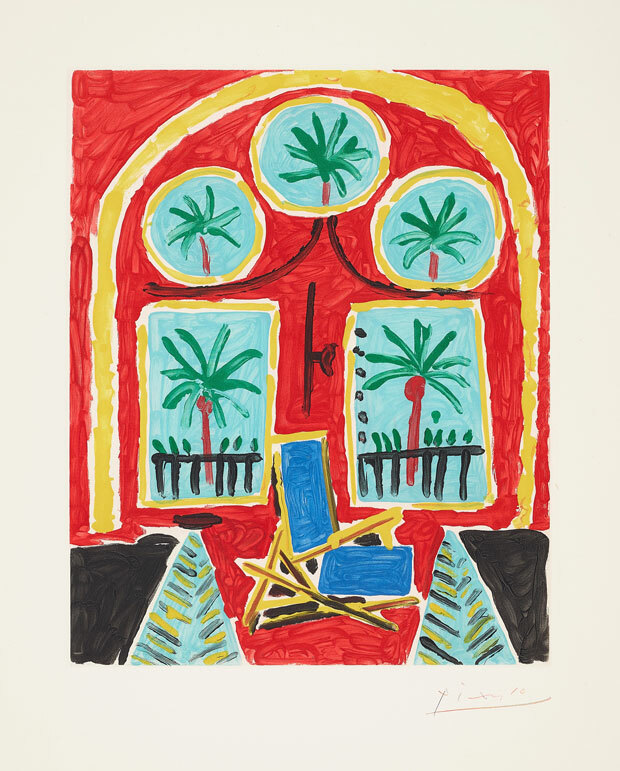 While there are etchings and aquatints by everyone from Braque to Le Corbusier, Jasper Johns, Jim Dine and David Hockney, and intriguing Joan Miró preparatory drawings and working proofs with hand-colouring and printing notes by the artist, it is Picasso who dominates. This is hardly surprising. The Crommelyncks were responsible for almost half of the master’s intaglio images, a large portion of his entire graphic output. They even followed him down to Mougins in the South of France, setting up a makeshift studio in a former bakery to be close at hand. Oddly enough, it is not the original prints that are the most immediately arresting here but the humbler ‘reproductions’ after his paintings. These aquatints, appropriately called gravures d’interpretation, are works of remarkable virtuosity. Here the brothers experimented with various toxic chemicals in order to achieve the requisite tonal and textural effects of impasted pigment and crayon. 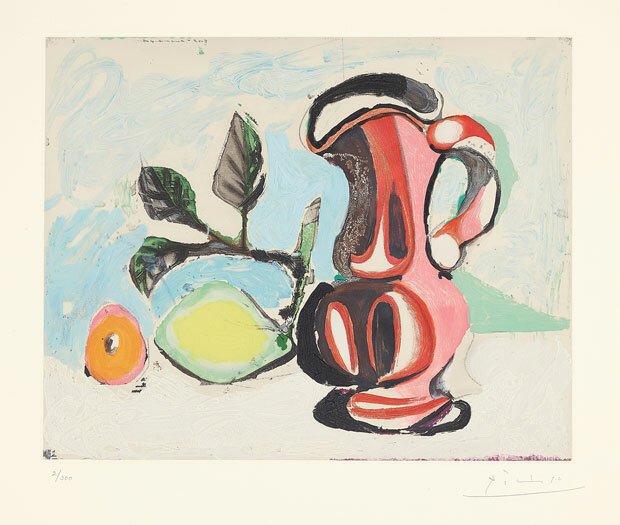 Nature morte au citron et pichet rouge and, appropriately enough, the image of Picasso’s house, Le Californie (intérieur rouge), are astonishingly fresh and vibrant (both estimated at $6,000–$8,000). 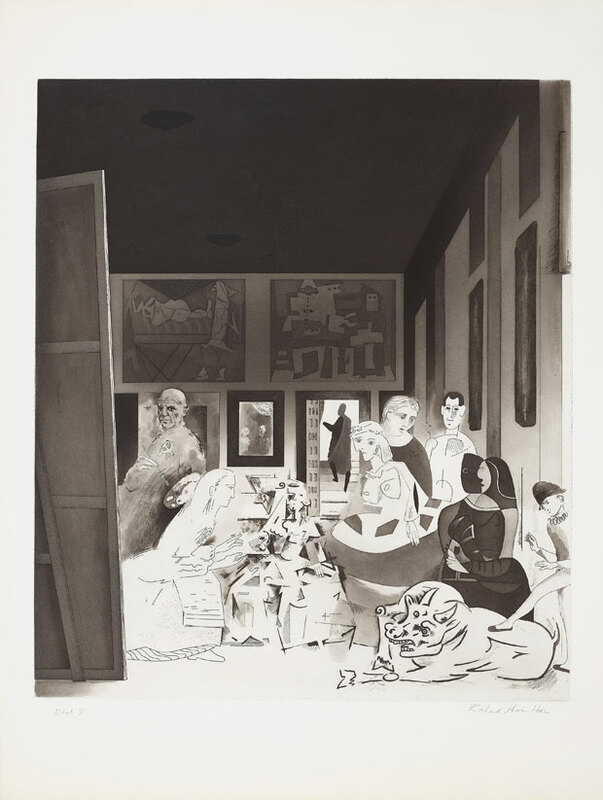 The star lot is a complete set of Picasso’s Le cocu magnifique of 1968, the complete deluxe portfolio of 12 etchings accompanying the text of Fernand Crommelynck’s eponymous play of 1921, with an additional suite of a further 12 etchings ($70,000–$120,000). Turned into a film in 1965, the subject could not have been more appealing to Picasso: the demented hero’s fear of being cuckolded could only be appeased by ensuring that he became one, and so he offers his wife first to his best friend and then to every man in the village. Printed and published by Atelier Crommelynck in Paris, the project may be seen as a filial act of homage. 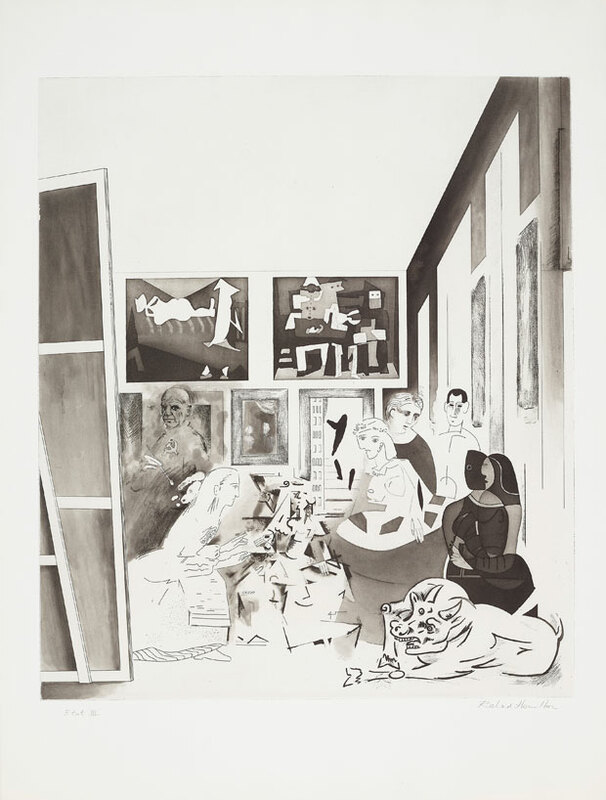 Another tour-de-force homage is Richard Hamilton’s Picasso’s Meninas of 1973. 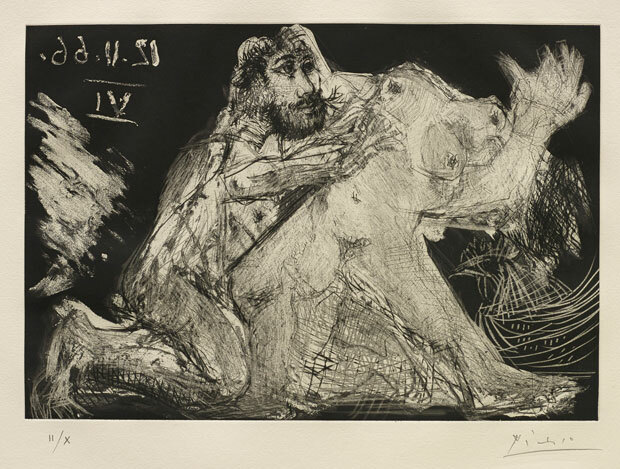 Picasso’s scrutiny of Velásquez’s masterpiece had led to some 44 works of art. Hamilton had seen Las Meninas at the Prado in 1972. He wrote: ‘The temptation to paraphrase Velásquez in Picasso’s styles proved irresistible…Las Meninas provided an opportunity to run the gamut of Picasso’s ‘periods’ in one plate – from ‘Rose’ through ‘Analytical Cubism’ to ‘Primitive’ to ‘Neo-Classical’ and so on…and the mysterious ambiguities…allowed some narrative interplay with substitutions of personalities as well as styles.’ Picasso has been substituted for the self-portrait of Velásquez working at the easel, the cross of St James on his chest replaced by a Communist hammer and sickle, and two of his paintings now decorate the back wall. 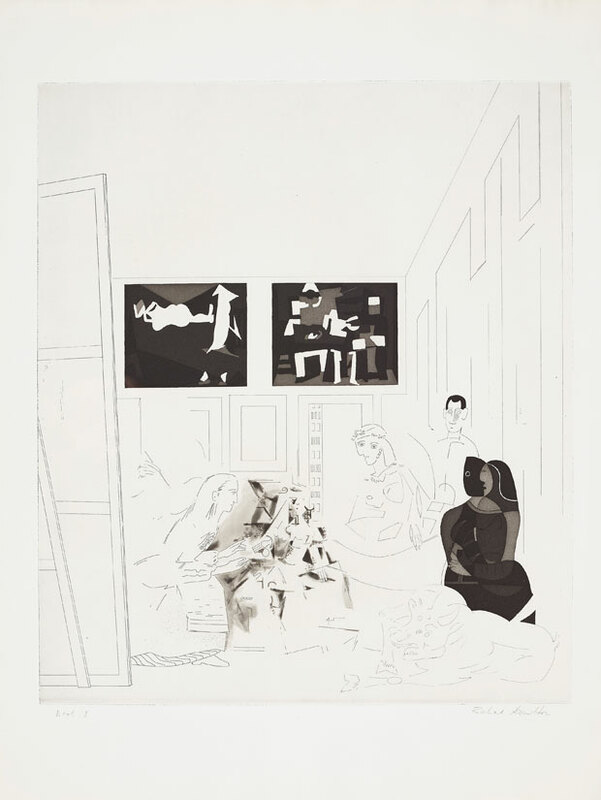 In the doorway, instead of a watching Philip IV and his consort, Hamilton has inserted himself and his girlfriend, executed in a particular etching technique invented by Picasso. Hamilton, like Picasso, was a natural printmaker. When he accepted the commission from the Propylaen Press in Berlin to contribute to their 90th-birthday Hommage à Pablo Picasso, he wanted to reflect Picasso’s own love of the medium and his respect for craftsmanship, and to that end made his contribution conditional on having Aldo Crommelynck working with him. On offer here is a rare and fascinating progression of signed and annotated impressions from three of the six states, I, III and V ($40,000–$60,000). Hamilton may be playing art-historical games, but his and Crommelynck’s mastery of combining complex techniques – here etchings with roulette, aquatint, drypoint and burnishing – is self-evident. Estimates begin at $1,500.